William Norman Davison was the son of Harper and Mary Ellis Davison. William was born in Moneymore on 2nd June 1894. Harper was a magistrate and property broker. Later, Harper derived his income from slaves. William emigrated to Canada to join his older brothers Harry and Jack. William Davison enlisted in the army on 22nd September 1914 at Valcartier. He was 20 years old. In January 1915, Private Davison was taken to hospital, where he spent the next two months, with an unknown illness. 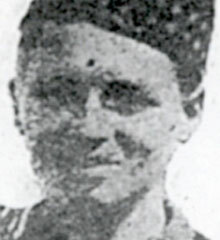 Private William Davison rejoined his Battalion in May 1915. 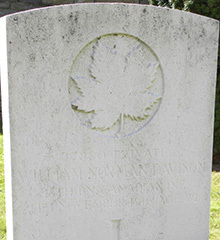 Private William Norman Davison was serving with the 15th Battalion of the 48th Canadian Highlanders when he was killed in action on 4th November 1916. He was 22 years old. Souchez is a village some 12 kilometres north of Arras on the main road to Bethune. Zouave Valley Cemetery is approximately 2 kilometres south-east of the village, and lies in the valley which extends southwards from Souchez on the western side of Vimy Ridge.